Find out which stocks were essential to the average's record run. It's hard to believe, but eight years ago today, the Dow Jones Industrials (DJINDICES:^DJI) were below 7,000, and many feared further losses that could send the global financial markets into chaos. 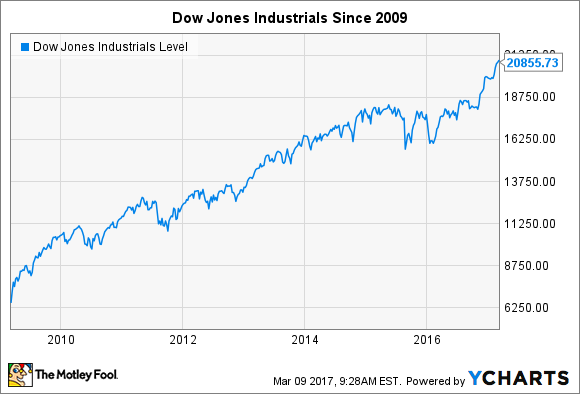 Just eight years later, the Dow has tripled from those levels, and the mood going forward is much more optimistic. When you look at what has powered the Dow's advance, the most interesting thing you'll notice is that seven component replacements within the venerable average have happened in relatively short order, and those additions have been major contributors to the gains the average has enjoyed. It's illuminating that the top two returners and four in the top 10 have joined the Dow in just the past eight years. UnitedHealth Group came into the index in 2012, while Visa and Nike became Dow components in 2013. Apple is the most recent company to join the average, getting its invitation in 2015. Note that their late entry hasn't prevented some of these key stocks from having huge impacts on the average. Visa, for instance, has seen its stock nearly double since joining the index as international electronic payments volume has dramatically increased. Economic expansion has helped increase money flows, and Visa's ability to dip into that stream with its global payment network has paid off. Moreover, before Visa decided to split its stock, its high share price made it one of the most influential components within the Dow Jones Industrials, and the overall average benefited disproportionately from its gains than from moves in lower-priced stocks. For Apple, though, the influence hasn't been as significant. The tech giant's admission to the Dow came near its high point, shortly after a 7-for-1 stock split that brought its share price low enough to attract the attention of those who run the price-weighted average. In the following year, Apple lost a third of its value, but in the recent push higher for the Dow to new record levels, the iPhone maker has played an instrumental role, and shareholders have finally enjoyed some of the benefits. UnitedHealth Group has given the Dow strong performance since its admission in 2012, with its share price more than tripling over that time span. The healthcare industry has seen a lot of change over that period, with the rise and seemingly imminent fall of the Affordable Care Act having presented substantial challenges to the health insurance industry. UnitedHealth has been able to benefit dramatically from going beyond health insurance through its Optum line of businesses, which incorporate pharmacy benefit management and various health-related services to try to get corporate customers to encourage wellness and health improvement practices. These services have helped clients cut their healthcare costs, and they've proved immensely profitable for UnitedHealth in its tenure as a Dow component. Finally, Nike has continued to prosper from the popularity of athletic apparel and footwear, but share price gains since it joined the Dow in 2013 have been more modest, amounting to a roughly 50% to 60% rise. New competition has emerged in the space, and that has forced Nike to retrench and find ways to use its powerful brand presence to stoke growth. The company remains the giant in the industry, but it will have to keep fighting in order to regain its dominance and send its stock back toward record levels. The Dow's climb since 2009 is monumental, and newly admitted stocks to the average have played a vital role. More importantly, Apple, UnitedHealth, Visa, and Nike will have to keep doing well if the Dow is to stay in and move further into record territory in 2017 and beyond.